They say this place is also known as the ‘Scotland of India’ Well it, certainly looks like! I’m all geared up. After a very good quarter at work, meeting almost all my targets, before I start off with the next quarter, I thought to myself, why not take this short trip and club it with the Intel App Lab that I would be attending in Bangalore! I hope to thoroughly enjoy this awesome hill station with some beauty that awaits me on this awesome short trip. They say there are times when you got to let yourself go. Coorg is one such place where you will indeed experience those moments of letting yourself go and be one with yourself and nature. There are definitely many places which will rejuvenate your stressful self and help you back afresh with all the tasks. Am I ready to go there or what? One of my another on the spur of the moment trips, here is what I think I’d be doing. Hope to get to these places provided there isn’t too much of rain (heavy) considering the rain has caught up already with this part of the country. Raja’s Seat in the town of Madikeri is where the kings would sit and watch the sunsets with their consorts. This is considered one of South India’s most scenic locations. The view from Raja’s Seat is breathtaking as you gaze upon the green valleys and towering hills. This is the perfect place to sit with a glass of wine and watch cars curving up the road to Mangalore that lies in the valley like a flowing ribbon. The government has set up a garden all around Raja’s Seat. This is the ideal place to go for a morning stroll. The Omkareshwara Temple was established in 1820 by Lingarajendra II with Mumammadan style architecture, which featured a center dome and four corners with turrets. According to legend, the king put a pious Brahmin to death unjustly and built the temple to appease the Brahmin’s spirit. The Omkareshwara Temple is like a Muslim dargah and has a Linga near the door of the entrance. The history of the temple was inscribed by the king on a plate made of copper that is hanging at the frame of the door to the temple entrance. Mercara Fort can be found on elevated ground atop Madikeri. The fort was originally made out of mud and rebuilt by Tipu Sultan with stone, only to be wrested back by the Coorg King in 1791.There are two mortar elephants, built life-size to catch the visitors’ eyes as they enter the fort. Inside the fort, the British took out the temple of Virabhadra in 1855 and replaced it with the gothic-style Anglican Church, which has since been converted to a museum. The Madikeri Palace is inside of the Madikeri Fort and is home to the office of the Deputy Commissioner. The Palace was established by Lingarajendra Wodeyar II in 1814. The two-story structure was renovated by the British two times and a clock tower and portico for the commissioner’s car was added in 1933. Coorg’s most popular waterfall is a 8 km drive from the main town. Every year, at a predetermined time, water gushes out from a small pond at Talacauvery, the birthplace of river Cauvery. Talacauvery is located 44 km from Madikeri, on the slopes of Brahmagiri Hill. Besides being a pilgrimage center, Talacauvery is known for its natural beauty. 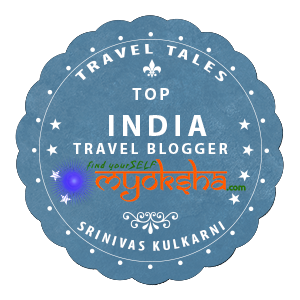 This entry was posted in South and tagged Bangalore, Coorg, India, Madekeiri, Raja's Seat, Scotland of India, Travel on June 25, 2010 by srinistuff.